Our 16-hour journey to Copper Canyon was pleasant: six hours in a comfy bus, hanging out for a few hours at the bus station, and then a six-hour train ride through some beautiful country to Bahuichivo, the entrance to Copper Canyon. Our group split up here, with most taking a three-hour shuttle down into the canyon to Urique. Two of us, Luis Escobar and I, joined another, much bigger group to hike into the canyon the next day. We stayed at Hotel Paraiso del Oso with about 40 other Mas Locos, most of whom were also doing the long hike. That night, though, I was emotionally caught off-guard by the impromptu mini-memorial we had for Micah True (or Caballo Blanco, as the local Raramuri Indians referred to him). A little history about the race… in 2003, Micah True decided to organize a race in the Copper Canyon for the Raramuris in order to bring some attention to the amazing distance runners that they are, and as a way to help provide food for them. The first few years of the race were quite small, but then in 2006, True had a vision to bring together the great Raramuri runner, Arnulfo Quimare, and Scott Jurek, champion of the previous seven Western States 100’s. This worked quite well in helping to gain more attention to the event, as Arnulfo and Scott both agreed to attend, as well as other Americans, including Luis Escobar and Jenn Shelton. Also, a writer named Christopher McDougall happened to attend that year. 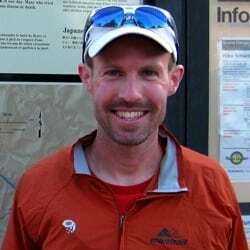 Most people know who McDougall is, and it was this 2006 Copper Canyon 50-mile event that provided the main scenes and characters for the book Born to Run. Back to the impromptu mini-memorial… after dinner at Paraiso, a few people said some very moving tributes about Micah, his vision of the event, and the type of person he was. Although I never met him, I was moved by hearing about the mutual respect he had with the Raramuris, and about the obvious love that so many had for him. After a chilly, high-altitude night of camping in temperatures that got down into the low 20’s (which isn’t too pleasant after spending the previous 2.5 weeks with temperatures in the 90’s), the next day brought about the big hike. We were fortunate to have four local Raramuri high school students as our guides for the 24-mile trek. The first half mile was on a dirt road, then we turned onto a trail and met with a suspension bridge to cross and enter the canyon. Before crossing the bridge, Luis gave a great little talk about the 2006 journey and how everyone was required to hike down to Urique, as that’s how Micah wanted it because that’s how the Raramuris would get there. Micah wanted the journey to be as authentic as possible. We then recited the pledge that Micah had the group recite in 2006, “If I get hurt, lost, or die, it’s my own damn fault.” And with that, we were off. Our young guides were great for this journey, talking and laughing along the way, and showing us points of interest. I enjoyed hiking much of the day with Luis, as he shared many memories from the 2006 trip. At the top of one climb, there was a big pile of rocks with a cross erected in the middle. Curious, Luis asked one of the guides what it was. “Cruz,” a cross. We got a good laugh out of that. As the day went on and we got deeper into the canyon, we would occasionally come across patches of lush, green plants. Many of us were thinking the same thing, What’s up with such greenery in this hot, dry canyon? What kind of plants are these? Then a bit later, What about the elaborate sprinkling system? Someone obviously spent good money to get that in here. It was about that time I noticed the beautiful bright red-ish/orange-ish color of the plants’ flowers. I also happened to glance down at my shoes and noticed the color resemblance between my shoes and the flowers. Hm, my shoes are Poppy color… wait a minute… I think I know what kind of plants we have here! It was slightly unsettling to be walking right through poppy fields, but since that’s where the guides were leading us, we figured that was the way. After nine hours of being on the trail, our group excitedly arrived in Urique! We all split off to our lodging choices for the week, where I was fortunate to get a tent spot at Entre Amigos, complete with access to their vegetable garden and fruit trees, and showers heated by fire. It was a very quaint spot. The main activity for the next day was a four-mile hike up part of the race course on a beautiful trail to the grapefruit oasis Los Alisos, where we were warmly welcomed by the owners with an all-you-can-eat buffet of the sweetest grapefruit on Earth. In addition to seeing part of the course, there was also a memorial was planned for Micah at Los Alisos. This memorial was moving for all who were fortunate to attend. Out of respect for those who were involved, I am choosing to not write about it in detail. After filling our bellies with grapefruit and hearts with emotion, we ventured back down the sweet singletrack. I got into a good group zipping down and around the tight switchbacks, and powering up the short, steep, little climbs. Before we knew it, we were back to the road with the option of waiting around for a shuttle or running seven miles back to Urique. Patrick Sweeney, Dave James, and I decided running would be much more fun, and in a little less than an hour, we were back in town. A nice soak in the cool Urique River was the perfect way to cool down after the warm run, as well as soothe the legs after 40 miles in the past two days. The afternoon river soak quickly became an afternoon ritual for me the rest of my time in Urique. Another ritual for me included food, as in eating it. I fell into a routine of always ordering “dos burritos, con carne” for my meals. It was simple and I knew what I was getting. At the restaurant I most-often frequented, I ordered this three times for the same meal. The cook/waitress/owner couldn’t believe I could eat it all! Good, inexpensive, home-cooked meals – I loved it! The next day’s hot and hilly hike took us the other way on the course, to the village of Guadalupe Coronado. We got a history lesson of the town and church, and a highlight for me came when we were shown God’s middle finger, the statue that provided part of the cover photo for the book God’s Middle Finger. I had just finished reading the book before my trip, so it was pretty cool to see the inspiration for the title. After a nice run back to camp, and the afternoon rituals of soaking and dos burritos, con carne, plus a little snooze, the entire international group of runners walked the mile to the Raramuri camp that evening. We all shared a traditional pre-race meal of (freshly slaughtered) beef and bean soup, and ended the evening by offering all of the Raramuris a blanket. As at all of the gatherings, Micah’s presence was very much felt by all. No doubt he would have appreciated everybody coming together to celebrate the upcoming race. The pre-race meal was actually two nights before the race, so we still had one more day until race day. It started off with a bang, as the kids’ race got underway first thing in the morning. Like the kids’ race at Fuego y Agua, these kids ran with pure joy. Kids are kids the world over, and they all love running, playing, and, well, just being kids. I was fortunate to witness this at both of these wonderful events. The afternoon included a festival with many dancers for entertainment, and ended with an announcing of the countries represented for the event, and presenting a representative from each country with a sign with their country’s name. For Mexico, instead of just announcing Mexico, they divided it up into the different Mexican states. When Durango was called, nobody claimed the sign. Second call, and nobody claimed the sign. After the third call and still nobody from Durango, Mexico, claiming the sign, I decided to claim it since, after all, I live in Durango, CO, and there were four of us in Urique from Durango. We all thought it was appropriate. After a quick night’s sleep, all 550+ runners were up and ready to roll at 6 am for 50 miles of fun. The start was the craziest and scariest I’ve ever encountered, including high-school cross country. At the word “Go,” the Raramuris took off like the race was only a mile. They weren’t just acting like they were running for food; they actually were running for food. The course consists of four separate out-and-back loops, and the more loops they run, the more vouchers for maize, beans, rice, flour, or corn they received. Depending on how far one ran, and how many family members were running, a family could be fed for many months based on running that one day. That is obviously motivating. Some Raramuris ran as hard as they could for as long as they could, and then called it a day, while others pushed through obvious pain to finish all 50 miles. As the day went on and the miles went by, the temperature rose, eventually plateauing in the mid-90s for many hours. While most international runners carried water with them, the Raramuris mostly didn’t, instead, just relying on the aid stations. Despite training this way, racing in the hot, dry weather beats you up a lot more than training in it, and thus, many of the Raramuris were unfortunately getting pretty hot and dehydrated as the race went on. Despite offering water when I would see one, they always politely declined. The Raramuris are a very proud and private people, and rarely like asking for, or accepting, help from others. As this was also race, there were overall men’s and women’s champions. However, it was very clear that the race was a small part of the event. The cultural aspect of learning about the Raramuris and the struggles they’ve faced was very moving, as were the acts of kindness done by the Raramuris. One of my friends and fellow travelers, Dawn Burke, experienced something pretty special during her day on the trail. As she says, “I was about a half mile into the second loop when unexpectedly some men (not part of the race) began laughing at me and saying that I am pretty but slow and telling me to stop running and go back. Then some men were yelling at me to hurry up. Finally, a man chased me with a stick and yelled, ‘Corre’ (‘Run’) repeatedly. It all happened in a matter of moments from both sides of the road. The Raramuri were running past and suddenly a group of five stopped running and came back to shake my hand one at a time and each said that wonderful phrase, ‘Kuira ba’ which means, ‘We are one.’ It was a powerful moment for me that reminded me of why I was even in Urique; it was not about the race itself or anyone else, but about me and the beginning of my journey as a runner. I was gently offered the respect of the greatest natural runners and I was transcended to a place of acceptance that I am a runner because I have the spirit to get out there on the trails. My soul feels free when I am in the moment of just developing my own rhythm of heartbeat, breath and footwork. Those Raramuri men gave me the gift of honoring me for my desire to just, ‘Run free.’ I believe Micah would be proud to have known that happened. As far as the actual race, it started out hot and heavy up front, with a big pack of about 20 guys bunched together, including American Dave James, and not giving an inch during the first loop to Guadalupe for the first 10 miles. It was way too quick for me, as I arrived at aid two at mile 10 in about 100th place. The second loop started with a nice, long, five-mile uphill, mixing rocky road and sweet singletrack. The front pack started stringing out a bit here, and I began passing optimistic starters regularly. It was a nice, fun, fairly runnable climb, then upon reaching the top, we were greeted by the sun rising up over the canyon. The ensuing downhill was a sweet, not-too-rocky road where it was easy to just let my legs go. I did give up some time to a few zealous downhillers, but would reel them back in on the short ups. At about 22 miles, we went back through the Urique, where I grabbed more gels, Nuun, my hat, and sunglasses out of my drop bag, then continued on out of town the other way this time, headed to Los Alisos, the grapefruit oasis. This was just before 9 am and the day was heating up fast. Most runners were slowing significantly on the six-mile dirt road section, while I feeling good as I constantly kept my head and shirt wet. (These are tricks I learned from pacing Jamie Donaldson at Badwater.) Soon enough, I arrived at the four-mile singletrack up to Los Alisos and it was here that I had my one low spot of the day, caused from not eating enough on the previous road section. Instead of trying to muscle through my bad patch, I eased off the intensity and had a couple gels, hoping that a lower heart rate would help me digest them sooner. My plan worked and within about 25 minutes I was feeling good again, and was able to check up on the leaders, as they were flying down. The lead pack was no longer a pack, but most of the guys ahead of me looked strong, although Dave, in 12th, did mention something about not feeling so good (despite looking pretty smooth). By the turn around, I was in 30th and felt ready to let my legs have some fun going down. The next 10 miles were really fun. I was passing more runners, but more than that, I was able to see all of my friends, as this was an out-and-back section. Everyone was so positive and supportive, which really helped fuel me with confidence. I arrived back in Urique very surprised to find myself in 15th place. I heard German Silva, a former New York Marathon champ, had gone through solidly in first place, and was likely on his way to improving upon his second-place finish from last year. I quickly stopped at my drop bag for a few more gels and Nuun, and I was out to see about getting myself in the top-10 over the final 10 miles, which were a repeat of the first 10. The climb up to Guadalupe this time was much tougher. The combination of miles on the legs and a 95-degree sun pounding down on me reduced me to a walk for a few short pitches. Although I was feeling pretty good, I knew if I really tried to push it, my heart rate would quickly skyrocket because of the heat and I would blow up. I was surprised to see, not German, but another runner coming toward me comfortably in first. It was Ranulfo Sanchez Hernandez, and he was well on his way to winning in a fine time of 6:33 on this hot and challenging course. Defending champ and top Raramuri runner, Miguel Lara came by next, finishing second in 6:37. He was followed a few minutes later by fellow Raramuri Silvino Cebesare, holding onto the final podium spot in 6:40. German had blown up and trotted by a few minutes later, finishing in 6:46. Japan’s Hiroki Ishikawa was the first international runner, finishing solidly in fifth in 6:56. I was able to watch the women’s race unfold a good bit, due to the out-and-backs, and what a race it was! The top two kept fairly close most of the day, with winner Irene Vazquez pulling away just a little bit in each segment, winning in a great 8:38 to runner-up Beatriz Adriana’s 9:00. Third and fourth places were even more exciting, as only 27 seconds separated them, with Mexico’s Maria Rodriguez claiming the final podium spot in 9:33, to Japan’s Midori Kondo fourth in 9:34. I heard this was Midori’s first ultra, too! Not far back, finishing in fifth was Mexico’s Sandra Guevara Meza in 9:45. New Mexican Megan Dell was the top American woman, finishing in ninth place in 11:10. Really good days don’t come too often in ultras – for me, anyway. The Ultramaratón Caballo Blanco was one of those rare days. I was honored to run and race 50 miles with hundreds of Raramuri Indians – some of the very best distance runners in the world. I was ecstatic with my ninth place, 7:19; definitely one of my top-3 best-ever ultra performances. Six of the top-10 were Raramuri, two were Mexican, and two were international runners. I was proud to be on stage with such running greatness, and excited to stand with my Montrail teammate Hiroki as one of the two international runners. Being on stage with German Silva was a special bonus for me, as he was one of my running heroes growing up for his victory in Spokane’s Bloomsday Run. This was a very good day, indeed. The finish line stayed abuzz until the final runners finished in a bit over 16 hours. It was a very long, and for many, emotionally taxing, day on the trail. The spirit of Micah True shone down on this incredible event. The week in Urique ended rather quickly, with most runners beginning their long journey home early the morning after the race. For a group of five of us, we were lucky enough to hire a six-seat Cessna for the most spectacular airplane ride I’ve ever been on. Just the take-off alone was exciting enough, going from zero-to-airborn in 10 seconds, and then for most of the next 75 minutes, we were gliding through one of the deepest canyons in North America. It was an incredible way to end an amazing week spent learning about the Raramuri. Full men’s and women’s results. Sean, what an excellent review of this amazing journey!!!! Congratulations for your amazing finish. I hope to meet you again and let us know whenever you come back to Mexico Lindo!!! I've been waiting impatiently for your report, it was well worth the wait and thank you for including the portion on Dawn's experience. Appropriate conclusion to a wonderful series. Very well written and one of the best reports I've read in awhile. Thanks for sharing. Well done, Sean! Thanks for the great narration of your adventure, and congratulations on your awesome performance! Thanks for sharing this Sean. Did you mention the bloody knee? I didn't mention it because, unfortunately, it wasn't a very cool story, OD – just a small scrape on a cactus. But it looks kinda cool! Congrats Sean! It was so much fun running and hanging out with you down there. Next time I go I might try to take the Cessna out of the canyons. I hope to see you on the trails soon. Cheers! Thank you so much for sharing. Great story and fantastic narrative. Nicely done. Sounds like an epic adventure! Thanks for both right ups. Best of luck for the upcoming season and hope to see you at Sinister 7 in my part of the world! Thank you for the kind words, Marcelo. When I ran the CDR in 2009, I was told by many people that I had to run Sinister 7. I am very much looking forward to joining you this July! As someone who has only recently learned the joys of trail running, these race reports are a thrill to read. And I will run this race someday – maybe 2014, maybe 2015 – but I will be there. Huge kudos for taking ownership of the Durango sign. Great report and cap to a really enjoyable series. You capture the spirit of the Raramuri, Micah, and el Canyon del Cobre beautifully. It is a rare treat to read a race report that is also a moving tribute. Welcome back: I'm sure we'll be in touch again "at" the store! Amazing..wonderful journey, thanks for sharing. Great report, Sean. Looks like it was an amazing few weeks of traveling and running. Very cool. Sean was first gringo and top ten! Great write up Sean! Thank you, AJ! That's so cool you guys have visited Copper Canyon, too. We'll definitely have to compare notes next time we see each other – maybe July (unless you want to come to Sisters with my parents next month to help at the Rumble!). Oh I would love to, but I'll be recovering from my herniated disc surgery. Hope to be ready to CRAWL Bloomsday on May 5th. Yes, we'll talk Copper Canyon in July. I'll try to remember our photo album. Nana went also but on an earlier tour. Loved the area! Pretty sure we visited that tiny church in your picture. Our guide made each of us girls a bracelet to honor "Nuestra Senora de Guadalupe"—our mother of Guadalupe. It's a special remembrance.